In 2018, 1 in 5 jobs in America is held by a worker under contract. If you are one of these contracted employees–or you want to be–there are a likely a lot of questions you’d like answers to. Let’s discuss some of the concerns of independent contractors and how you can be proactive in finding solutions. Note: In this article, the terms independent contractor, IC, contractor, freelancer, and gig worker will be used interchangeably, though technically there may be some trivial differences. 1. Why should I work as a freelancer? There are many reasons why contracted work is appealing. 94% of net jobs created from 2005 to 2015 were impermanent positions. That means that almost all news jobs in America are available to contractors and the “gig economy” is here to stay. Contracting may be the best way to find work in today’s economy. There will always be contracted positions, while full-time employment may be harder to find. In fact, many labor economists believe that within a decade, freelancers will outnumber full-time employees. Everyone knows that the workplace comes with a certain amount of drama. By working freelance, you pull yourself out of that environment and you even get to skip staff meeting! Contractors find their own jobs and can choose which projects to take on and which ones don’t suit their interest. They don’t have to worry about getting laid off as they can juggle multiple projects at once. Additionally, gig jobs allow you to try out a position or company before committing to full-time work. Some 34% of part-time workers are looking to secure a full-time position, and contracted work can be an awesome trial run for both you and your employer. One of the biggest perks contractors reference is greater independence. Typically, independent contractors have total freedom over where and when they work. 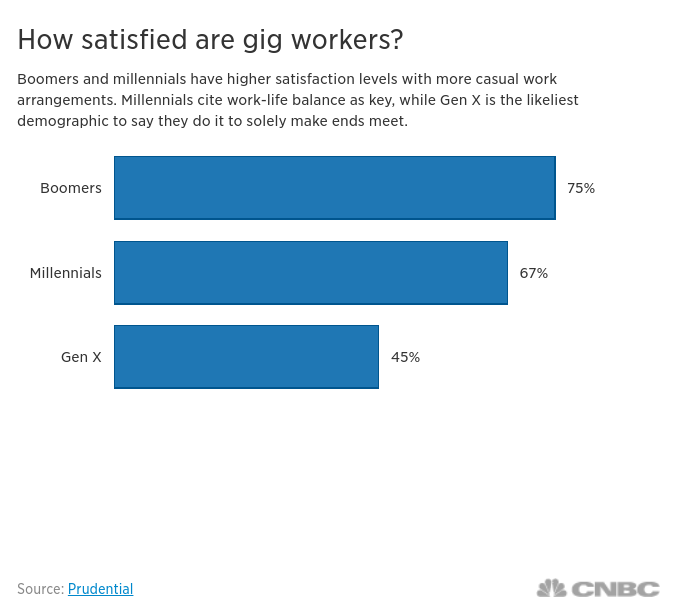 Millennials, specifically, say they have higher satisfaction with more casual work arrangements like these, citing work-life balance as key. As a gig worker, you can alter your schedule to be able to spend more time travelling or with your family. You can still do something you’re passionate about–like work for a nonprofit–but you can do it from the comfort of your own home. Or you can bring projects with you wherever you go, working from a cafe in Paris if you like. Some contractors go so far as scheduling all their work for certain months of the year, in order to have more flexible vacation time. There are financial benefits of independent contractor jobs as well. Contractors can earn more money than employees primarily because they take a lot more home and they often control their asking rate. In addition, they can balance multiple sources of income by taking on various projects. The payments received as a freelancer don’t have any federal or state income tax withheld, which means each paycheck is a bit higher. You will pay a self-employment tax on your federal tax return, but smart financial planning and good bookkeeping will pay off in the end. Finally, you can deduct business expenses (including travel, space, meals, etc.) using a Schedule C (Form 1040) to minimize personal cost. 2. What are some challenges I will face as a contracted worker? While working as an independent contractor is appealing for many reasons, it will also come with its challenges. The shift to contracted work also shifts responsibility to the contracted worker. The IC is responsible for saving for retirement, acquiring health insurance, and paying taxes. In addition, close to half of contracted workers say that their income changes month-to-month, or seasonally. This means that as a freelancer, you ought to be financially responsible. Create a budget and stick to it. Save for a rainy day. Put at least 20% of your income away for taxes. Save for retirement and don’t forget to invest. 3. How can I find independent contractor jobs? Now that you’ve weighed the Pros and Cons, let’s start the process. Maybe you’re looking into freelance work because you have a specific field in mind. Maybe you’re looking to make a little extra on the side to help pay off some credit card debt. Or maybe you’re just looking for something to do with your free time. Building a Resume is a little different as an independent contractor, but a lot of the principles of a good resume still stand. As an experienced IC, you probably have a variety of experience and projects you could list. Choose 2 or 3 of the most relevant projects to a specific job. Have a list of glowing references ready to send. Highlight your flexibility, ease of communication, expansive knowledge base. Some freelance sites, like Upwork, don’t even require a Resume. Instead, they ask you to create a profile and submit proposals by writing detailed, professional cover letters. If you don’t consider yourself a great writer, ask a friend to help you draft a basic template for a cover letter or proposal which you can then alter based on the project you are looking at. In our day and age, finding a contract job is as simple as performing a search on Google. Here are a few websites that you could start with. For more long-term freelance positions, start with the most common Job Boards: Indeed, LinkedIn and ZipRecruiter. Use one of the job categories above as your search keyword and then use the filter to select “Contract” under “Job/Employment Type.” These job boards are user-friendly, widely accessed and regularly updated. Each site allows you to upload a resume so you can submit an application with one-click. However, they do tend to have a fewer number of independent contractor job listings as compared to freelance sites. Freelance Sites are various job boards specific to gig workers. We’ve listed a few websites that you could start with. Be aware that each site has distinct qualifications: free vs paid listings, bid-per-project vs flat-fee, quotes vs proposals, etc. Upwork is a favorite among freelancers. You get to choose your own projects and can filter based on industry categories and skills. As you continue to get jobs through Upwork, you can build up good reviews and client relationships and will be able to earn more money per job. Start by Creating a Great Profile: Upwork requires a current, professional profile to apply for jobs on their site. Pick a friendly-looking picture and give an accurate introduction of your experience, education and accomplishments. You can also take their online skills tests to verify your professional level of expertise. Writing Proposals: Before you can get an interview with a potential client, you have to submit a proposal. Upwork recommends tailoring your proposal to the job you’re seeking and ensuring that your writing is error-free. Whether or not you are applying to a writing position, grammatical errors show a lack of attention to detail, which no employer wants to see. Make sure you are accurately representing your skills and strengths. Be honest and approachable. Working with Clients: If you can communicate quickly and clearly and do great work, you will gain clients in no time. Meet every deadline with prompt delivery and graciously accept feedback. Upwork also offers a mobile app to simplify messaging and collaboration. Getting Paid: Upwork allows you to be paid hourly or at a fixed-rate. They help you to set milestones with your client, so you can receive payment throughout the project. Other payment tools include invoices, timesheets, work diary, automatic billing and multiple payment options. Need to Know: Upwork does require a “Freelancer Service Fee” based on how many projects you work and how much you make. The Fee is 20% for your first $500, then 10% for $500-$10,000 and finally, 5% for $10,000+. Basically, they reward you for loyalty–the more you make through them, the smaller the fee. Similar to Upwork, freelancer.com requires a profile in order to write a bid. You can browse jobs based on skills, expertise, price and schedule and you get alerts when relevant jobs become available. When writing your bid or brief, they recommend being thorough, professional and competitive with your pricing. Freelancer also hosts Contests to showcase your work (typically in design, video, writing or programming) though there is an entry fee if you are not a registered user. Freelancer also has a mobile app. Create a profile and submit quotes to open jobs through Guru. They also offer skills tests and a variety of payment agreements: pay by milestone, task, hour or recurring payments. Creating an account is free, however many of the perks of Guru (10+ monthly bids, premium proposals, etc.) are reserved to paid memberships. Toptal advertises as listing only the top 3% of freelancers. They have an in-depth screening process including language, personality, skills and project tests. However, once you make it past the application process, you get to work with big names like HP, Airbnb and Pfizer. 4. How will I handle taxes and 1099s? As we explained earlier, working as a contractor can actually simplify your tax processes, since you don’t have anything withheld in your monthly paycheck. However, you do need to take careful steps to ensure that you file your tax return correctly and include any 1099s you received from employers. You need to know if you are considered an independent contractor or employee before you can know which tax forms to submit. 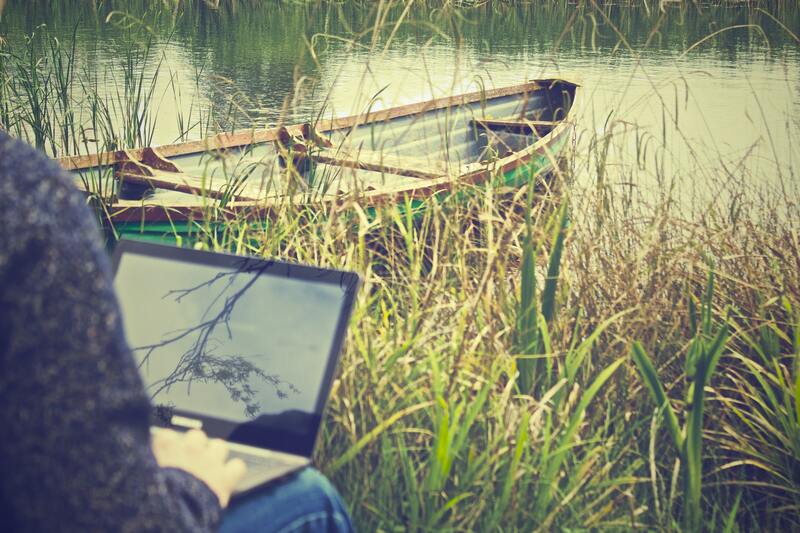 Independent contractors typically can work from any location, at any time. ICs can work for multiple companies at once and are often paid per project or with a flat fee. Companies have the right to control the result of IC work, but the IC maintains the right to control what work will be done and how it will be done. If your work matches these descriptions of an independent contractor, you will be subject to the Self-Employment Tax. The rule is if any client paid you $600 or more during the fiscal year, they will send you a Form 1099-MISC by Jan 31. If you do not receive a 1099 from your employer, you should request one. Even if you don’t receive a 1099, you should report all earned income to avoid penalties. For a more comprehensive explanation of 1099 forms, check out this blog post. 5. How can ZipBooks help me manage my IC business? As an independent contractor, you have a lot to worry about financially. You are responsible for billing, tax forms, etc. Let ZipBooks take some of the financial stress off your plate with our easy-to-use invoicing, bookkeeping and growth services! In addition to our free accounting software, you have the option to sign up for ZipBooks Pros which gives you real-time feedback which is published to the web. We’ve made it easy for you to invite customers to review you on Google, Yelp and Facebook. We publish those reviews with ZipBooks Pros and make them available to everyone, so they can easily find and hire you. If you are an employer looking to hire freelancers, ZipBooks can help you simplify your invoicing, payment and tax processing. ZipBooks is a free QuickBooks alternative that allows you to flag transactions as a 1009 expense and tag vendors as 1099 Contractors. ZipBooks also offers Professional Bookkeeping Services to help the independent contractor and the independent hirer. We are all about making accounting easier for you.